2016 Jean-Louis Dutraive-Grand Cour, Fleurie, Cru Beaujolais, France. The non domaine (estate) Fleurie is from a high elevation plot of old vines set on granite, crafted using semi-carbonic ferments and whole cluster and with very low SO2, aged in neutral cask and tank, just like all his glorious estate bottlings. 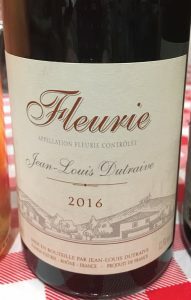 Dutraive’s 2016 Fleurie is at first very shy and almost austere, very different from his Domaine de la Grand Cour versions which are highly perfumed and expressive, but given time it starts to unfold with graceful and earthy layers of pure Gamay fruit, spice and mineral tones. This unfiltered Cru Beaujolais has a slightly cloudy ruby hue in the glass, best if decanted at this stage to get the aromatics awake, as the subtle floral notes are still hidden behind a more savory and feral tone that leads to a refined medium weight energy filled palate that includes wild raspberry, liquid strawberry, morello cherry and plum of restrained fruit essences as well as minty herbs, pecan shell, delicate leather and flinty stones. The mouth feel gains textural pleasure with air, but at first you get bright and juicy acidity that settles down nicely in this youthful wine, I personally think I caught this bottle in an awkward stage and that it should blossom in a couple of years in bottle when the fruit should become more present and the bouquet which is dull now (and this could also be from the shipping as I didn’t give it much time after receiving it) looks to be more seductive, that is my hope anyway, best to hold this one at least another year. I’m a huge fan of Dutraive, and while this is a fine example it doesn’t match the estate Fleurie(s) which I find as compelling as many Grand Cru Burgundies! Previous PostGrapelive: Wine of the Day November 22, 2017Next PostHappy Thanksgiving!